As school sports days get underway, students have resumed making large human pyramids, raising concerns about the risk of serious injury. 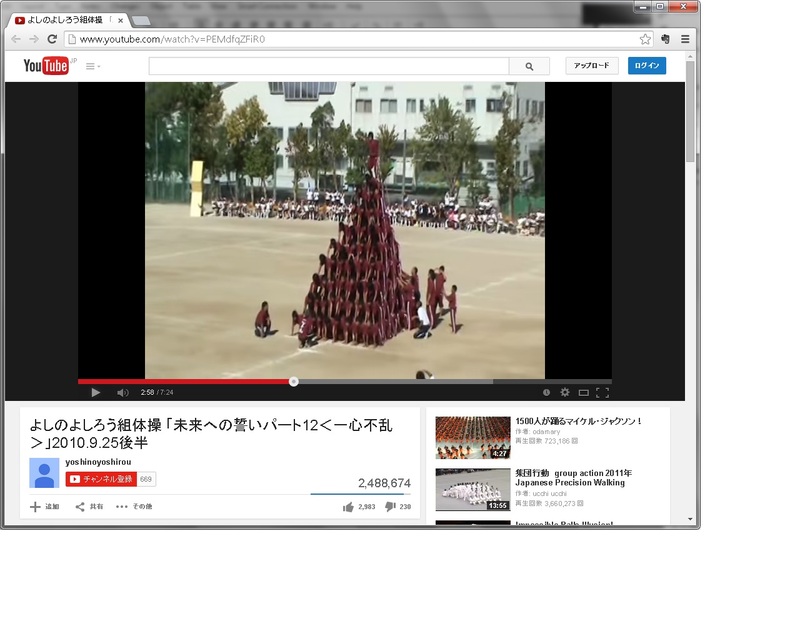 Teachers have begun posting photos and videos online of students forming structures with as many as 10 tiers. 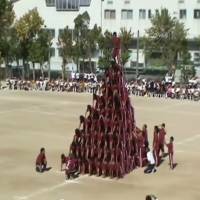 Despite the dangers, schools have students build the human pyramids for the sake of “the feeling of achieving it all together,” according to Ryo Uchida, an associate professor at Nagoya University and an expert on school injuries. As far as Uchida knows, the highest pyramids built so far reach 10 tiers for junior high students and nine tiers for elementary school students. However, some schools are trying to achieve 11 tiers, he said. There are no nationwide statistics focusing on injuries from human pyramids, which are formed by students arranged in a row kneeling on top of each others’ backs, with the top person standing. But injuries from “kumitaiso” (sometimes translated as “gymnastic formations”), a form of physical education in which human bodies are used to express various shapes, are tracked by the Japan Sport Council (JSC). And the situation is alarming. There were 6,208 injuries from kumitaiso at elementary schools in fiscal 2012, jumping 9 percent from the previous year, according to a council report. The report, compiled from data on medical insurance payments for school injuries, shows that bruises were the most frequent injury at 2,416, followed by 1,838 sprains and 1,584 fractures. The JSC’s injury database, which is available online and covers accidents from fiscal 2005 to fiscal 2012, includes a description of a sixth-grade boy who was in the third tier of a human pyramid and fell to the ground as the structure collapsed. He suffered permanent hearing damage, although the database does not explain how the impairment resulted. Another sixth-grade boy in the bottom tier of a three-tier pyramid sustained permanent spinal damage after another student fell on him. Despite the danger, some schools proudly display photos and videos of students forming human pyramids and performing other kumitaiso acts on their websites.